I expected to receive a number of inquiries pertaining to the recent meeting of the ad-hoc steering committee in Albuquerque facilitated by the National Park Service Route 66 Corridor Preservation Program and World Monuments Fund. Still, the number of these inquiries received, and the overall tenor that indicated cautious optimism was most surprising. Route 66 Association and a U.S. Bikers tour. A formal release will be published later this week and I would prefer to wait upon that before sharing my opinion or providing an in depth assessment and evaluation. However, as noted in my response to emails and phone calls, I left the meeting filled with optimism, enthusiasm, and excitement. The steering committee that represented a wide array of diverse interests associated with Route 66 gave careful consideration to historical precedent set by the creation of the U.S. Highway 66 Association, the needs of the Route 66 community as presented during the Crossroads of the Past and Future Conference at the Route 66 International Festival in Kingman, the conference in Anaheim last November, and the response to that conference, and unanimously drafted a mission and goals statement for development of a professionally led, representative body with an elected board. With that said, I ask for patience in regard to details or action. These things take time to properly develop, coordinate, and structure. Next, a few updates on our pending adventure to the Netherlands in January. At the top of the blog is an advertisement created by Willem Bor for the Dutch Route 66 Association. At this juncture it is not possible to promise that I will have books to sell during this informal meet and greet. There are an array of issues pertaining to shipping, taxes, etc. to be resolved. Still, it would be my pleasure to sign books for anyone who brings their personal copies, and to answer questions, provided you don’t expect an intelligible response in Dutch, German, or French. In the morning I will finalize arrangements with U.S. Bikers for our primary appearance which be at the Vakantiebeurs in Utrecht. The basic plan at this time is for me to be at their booth to answer questions pertaining to Route 66 and tourism in America. Details will be provided as soon as they are available. Needless to say I am quite excited by this opportunity. We look forward to visiting with our European friends and neighbors, and instilling a bit of excitement for an adventure on historic Route 66. Judging by correspondence received pertaining to the Route 66 conference and related activities being planned for the end of October next year in Edwardsville, Illinois, that is also a topic of interest. As I am only a consultant on this endeavor I lack detail aside from the fact that work is ongoing to ensure the event is unique as well as fun, and that it meets the needs of the Route 66 community. I will close this out today with a few notes pertaining to the ordering of books using the Paypal link with drop down menu at the top of the blog. If in ordering a copy of Travel Route 66 you receive a notice that it is sold out, please let me know. I have an adequate supply of the other titles in stock but this book is being reordered. As soon as they are available I will let you know, and special arrangement will be made to expedite shipping. At this time I can only offer domestic shipping, media mail. Other options are being evaluated. As an added bonus, the next twenty-five orders of any title will receive a special limited edition Route 66 souvenir at no additional charge. 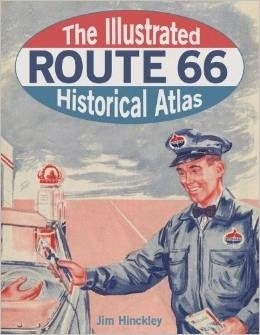 If you would prefer to support a worthy organization or great mom and pop book store with your purchase, the National Historic Route 66 Federation is offering The Illustrated Route 66 Historic Atlas in their on line store, and Auto Books – Aero Books in Burbank (they ship) has a limited supply of autographed copies of this book as well as other Route 66 titles by Jim Hinckley.